Do you need dependable and affordable roofing in Gladewater, TX? Call ECO Commercial Roofing today at (833) 200-0571 for the high-quality roofing services you require! Customer service is a primary goal of ours, and we can supply you with nearly any type of roofing assistance you may need. We are participating members of our community, and we’ve been reliable Gladewater roofers for a long time now. Our roofers are very knowledgeable on the many kinds of roofing, and we are glad to help you with any of your roof questions or concerns. For professional, kind, and helpful contractors, you can always depend on ECO Commercial Roofing! A trustworthy contractor is essential when it comes to any services for your house or business. We make sure that each of our roofers are taught to the industry standards, and we only buy supplies from suppliers we can trust, like Conklin. We understand that the roofing you pick can alter the value of your property as well, so we provide many different roofing varieties for you to choose from. In terms of benefits, be sure to consider the longevity and the benefits with the same scrutiny that you pick the style. Additional factors to consider include your budget, along with the kind of structure that is needing the roof. There are tons of roof options to pick from, and our crew is happy to assist you. Reliable roofing services are our primary priority, and we can deliver that in the form of repairs, replacements, and installations too. Our expert services are available for commercial, residential, and industrial projects alike. Our commercial services are perfect for businesses, shopping centers, apartment complexes, and similarly designed buildings with flat roofing. Flat roofing can be a bit tricky, and without expert installation, you might be stuck with leaks or ponding. If you are interested in industrial roofing, we have the perfect materials and skill set for industrial facilities, and we can help you get a roof that will last for decades. You can even depend on us for cost-effective residential roofing services, designed to serve your home in a variety of ways. Each roof company has a specialty, and ours is roofing restoration along with roof coatings. We have years of expertise with roof coatings, and we understand that using high quality products such as Conklin can make a major difference when the project is completed. If you need improved roofing in Gladewater, TX, you can rely on us to provide you with unbeatable craftsmanship, and top quality services. If you are looking for additionalmore information about the benefits of our Conklin roof coatings and our roof restoration methods, give us a ring today at (833) 200-0571! When a roof is approaching the end of its lifespan, you can typically decide to replace it or to restore it, and we often advise restoration. We use Conklin roof coatings in the bulk of our restoration processes, and with such coatings you can typically earn another ten years for the lifespan of your roof system. Picking a roof restoration from a quality contractor will conserve your time and money in comparison to a total roof removal and installation. Our main technique of roof restoration relies on top quality Conklin roof coatings. It can be difficult to determine which roof coating is best for your requirements, when presented with the expansive selection of choices, but our expert roofers are here to assist you! The type of roof coating you require will rely on the material of your original roof, in addition to the problems your roof faces most often. In many cases, the roof coating is installed directly to the previous roof’s system. To find out if your roof is eligible for our roof coating, contact us now at (833) 200-0571! Acrylic Roofing Fluctuating temperatures cause your roofing to expand and shrink, so acrylic is well suited for varying adjustments. 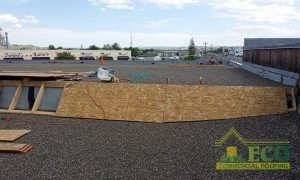 Among the many types of commercial roofs we can provide, are low slope roofs as well as flat roofs. The best way to prevent leaking and ponding is to correctly install the roof in the first place, which our professionals can help you with. 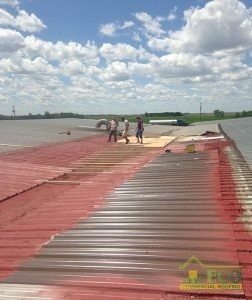 If you are searching for a flat roofing option that will endure for decades, you’ve come to the right company. Residential and commercial roofing services from ECO Commercial Roofing are dependable and affordable. We don’t only offer our expert roofing in Gladewater, TX, but additionally in the nearby areas. Deciding to invest in your building’s roof system will pay off quite nicely in the future. Give us a ring today at (833) 200-0571 with roofing questions, or if you would like to schedule your appointment with our expert roofers.